Australia's mandatory sentencing with its exact penalty system has been labelled racist by the UN. 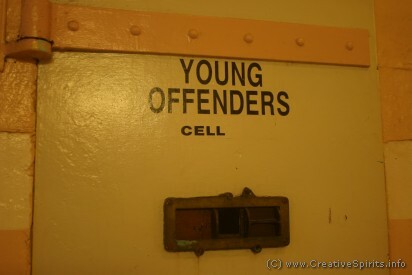 After being sentenced youths are likely to be abused or enter a criminal career, and some commit suicide. Only the Northern Territory has abolished mandatory sentencing. Mandatory sentencing establishes an exact penalty for each category of offence individually. Normal sentencing sets a range of penalties, allowing judges and magistrates to interpret the sentence according to the circumstances of the offence and the offender. Mandatory sentencing laws have taken away the discretion of magistrates to recourse individuals to non-custodial programs and sentences they deem are without risk to society. They must apply the sentence prescribed, it is mandatory. Western Australian and the Northern Territory both have mandatory sentencing laws. NSW and Queensland have mandatory sentences in some circumstances. Noongar man Wongi David Jonathon Yarran rode his motorcycle through Perth when police flagged him down to pull over but instead sped past, and in order to evade them drove on the wrong side of the road and ran a red light. Mr Yarran later said he panicked when he saw the police because he did not have a licence. In court, Mr Yarran pleaded guilty to evading police and therefore accepted this was an act of driving dangerously. He tearfully expressed that he was remorseful. Magistrate Felicity Zempilas delivered the mandatory six-month prison sentence. She said that if she could have she would have imposed a lesser sentence but lamented that she was not able to do so. Mandatory sentencing leads many Aboriginal youths to desperate decisions. Suicide is one of them. In 2000 the UN's Committee Against Torture called the mandatory sentencing laws in Australia racist. In 2008, the committee recommended the abolition of mandatory sentencing due to its "disproportionate and discriminatory impact on the Indigenous population" . It could also contravene the United Nations' Convention on the Rights of the Child . In the USA, after decades of minimum mandatory penalties, political parties have started backing away and campaigning to slash mandatory sentences for some crimes, saying the laws are outdated and have led to overcrowding of prisons . The most comprehensive mandatory sentencing laws exist in Western Australia (introduced in 1996) and the Northern Territory (1997). For years they resisted movements to change this legislation. Mandatory sentencing past and present. The text reads: '1800 a.d.--Stole a loaf of bread... transported to Sydney. 2000 a.d.--Stole biscuits & cordial... gaoled for a year in Darwin. 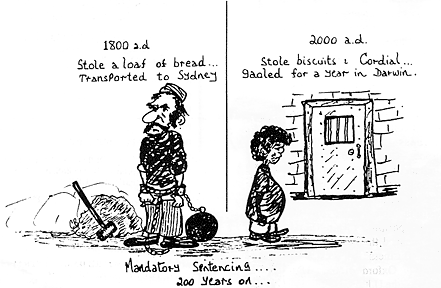 - Mandatory Sentencing... 200 years on...'  The cartoon compares how the British were sent to Australia for petty crimes in the 1800s just as Aboriginal youth is sent to prison for petty crimes today. Just a week after a boy's death, a 22-year-old Aboriginal man from the same community became the third young person to be imprisoned for stealing biscuits and cordial worth $23 from a Gemco storeroom on Christmas Day 1998. Jamie Wurramara and his friends did not hurt anyone—they simply walked into an open shed and ate biscuits because they were hungry. Wurramara was sentenced to 12 months' jail because it was his third "property offence". Another youth was jailed for 12 months and another, a second offender, for 90 days. According to the authorities, 15-year-old orphaned Aboriginal boy "Johnno" Warramarrba was found in his cell on February 9, 2001, hanged by a bed sheet. He had been taken from his remote community in the Northern Territory and imprisoned 800 kilometres away in Darwin for stealing property worth less than $90. By the official account, he killed himself just five days before he was due to be released from the Don Dale Correctional Centre. An officer had sent him to his room for refusing to wash up, and he was found unconscious five minutes later. Attempts to revive him failed and he died nine hours later at Darwin Hospital. There are many more cases where under-20-year-olds have been jailed for petty crimes and "damages" of less than 5 Australian dollars. In the case of Johnno Warrambarrba a public outcry followed, putting mandatory sentencing practices into the national spotlight and pressure on the government to respond. The focus of these laws seemed to be to protect property rather than people. A former Chief Prosecutor believes that mandatory sentencing is ineffective because it results in fewer guilty pleas because no discounts can be given for co-operation . Because it increases prison populations costs rise. You might think that today Aboriginal people are no longer jailed for petty crimes. But the following image shows that in 2009 young Aboriginal children were still facing court—and possibly a sentence—for stealing a chocolate bar. Its value: 70 cents. the level of custodial sentencing rose by 50% under mandatory sentencing. Property crime in the Northern Territory actually increased during the mandatory sentencing period and decreased after the abolition of the provisions . Nonetheless, in February 2013 the Northern Territory government passed new mandatory sentencing laws that increased the minimum time offenders spend in prison and restricted judges’ right to suspend sentences for certain crimes, a response to voters' calls "to be tough on crime" . In Western Australia, however, mandatory sentencing remains intact to the present day . In fact, in February 2013 the Western Australian government proposed to expand the state's tough laws, making it legal to detain children as young as 11 years and doubling the minimum jail time . In July 2016 the ABC's Four Corners programme presented a documentary on child abuse in the Northern Territory's detention centres, specifically Don Dale. The footage showed shocking abuses and violations of national and international laws, and sparked a Royal Commission.